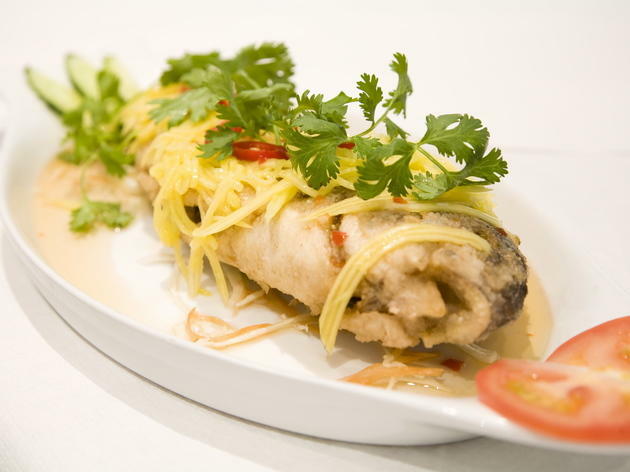 A family-run Vietnamese restaurant on the Kingsland Road. The Kingsland Road branch of this Vietnamese restaurant is an easy-going spot, with BYO, big tables and even bigger sharing dishes. It’s where you go when you want to feast with friends and not squabble about the bill afterwards. On our mid-week visit, it was rammed by 7.30pm. Floor-to-ceiling bamboo makes it feel like a dodgy set in ‘The Crystal Maze’, but service is friendly, if a little slow. Chargrilled quail is a Mien Tay regional speciality, with an addictive honey spiced crispy skin. It was messy, but worth every smear, and came with a lime-infused sugary salt that I wanted to sprinkle on every other dish. Chargrilled goat tasted suspiciously similar to the quail, but it was the best thing on the menu, with satisfyingly charred edges. The tofu crispy pancake was so impressive the next table ordered the same thing, but there were wobbles elsewhere. A rice flour crepe wasn’t crisp and the veggie filling was lacklustre. The ‘crispy’ sea bass also really wasn’t crispy. And the spicy beef brisket soup bowl may have been big enough to swim in, but the broth lacked depth. Mien Tay has a faithful following: the food isn’t going to blow you away, but it’s still BYO, so you’ll probably be having too good of a time with your mates to care. Vietnamese food is always so fresh, satisfying and appropriate for any weather, so definitely one of my ‘go-to’ places for when I want a reliable and cheap and cheerful feed. Another one of my favourite ‘simple but hard to perfect’ dishes is the humble pho. A great bowl of authentic pho will warm every crevice in your body that the winter chill has crept into and make you feel rather healthy with its clear soup and all those fresh herbs. The pho at Mien Tay is always consistent and has become my preference after trying a fair few of the others in this area and in London, thus earning it’s place on our ‘go-to’ list for vietnamese cuisine. It’s hard to try something else when you know the pho is so good; but if you’re interested in trying something different, the Bun Hue Bo and the Bun Nem Duong with spring rolls are great alternative classics. I’m also a big fan of anything with Nem Nướng̣, which I’m sure should be classified as an illicit drug in the form of chargrilled pork mince marinated with fish sauce and herbs. The deep fried sea bream is always crispy and succulent. You can never go wrong with a place that focuses on simple ingredients and punchy fresh flavours, so be sure to try the rest of their menu. Tip: they have a few restaurants - Battersea, Fulham and actually two on Kingsland road (one which has a more refreshed and modern interior with more comfortable seating). The original is the one that isn’t much to look at from the front and very green. Good For: catch up with friends, small groups, cheap and cheerful, something quick. 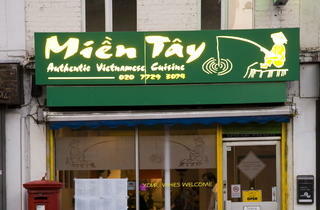 Mien Tay has the best pho you can find in London. 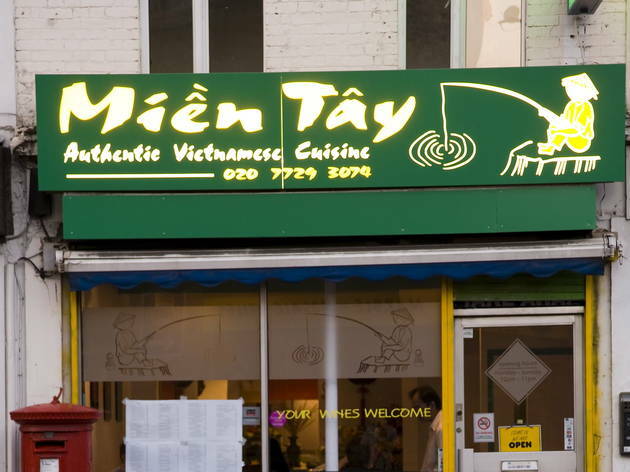 Not the best service or decor, but you don't go to Mien Tay if that is what you are looking for - you go for the amazing Vietnamese food which they definitely deliver on. Clapham branch is just as good as the Shoreditch one. The head-waiter (in 20/03/2018 evening) was unceremoniously bad-mannered that the service had affected the whole experience. Though the food was average quality. The worst restaurant experience ever. Shoddy service, rude staff, abusive staff. We waited for over an hour for our food and then we were given the WRONG order. When we tried to bring this to the attention of the waiters he was so rude and told us we had made the mistake. We refused to stay any longer but were then forced to pay for food we hadn't ordered owing to the waiters mistake. I have never been treated so badly in a restaurant ANY WHERE in the world. At one point our table considered calling the police. In the end we payed over £100 between the four of us for the wrong food orders. A little common sense and consideration would have led the staff to realise that the likelihood of 4 people getting their orders wrong was highly unlikely. As we left we were also left wondering if another table in the restaurant were also paying for our order. This will go down for me as one of the worst customer services experiences of all time. AVOID THIS RESTAURANT - the food was terrible, service terrible, staff were rude, Manager threatening and abusive, the toilets were filthy and our food took forever to come and when it did it took forever. Come to this restaurant at your own risk. Waited over 1 hour for food to arrive. Asked waiting staff a few times to which continually told 'food coming' and derided by staff and later promised discount for the poor service. When Bill arrived the promised discount did not manifest and one of male waiters was sent to strong arm us into paying the full amount and we were accused of trying to cheat the restaurant. We paid the bill but felt very intimidated. Waiter also admitted that they didn't like to tell customers when food was very late then they'd lose money thereby admitting that their shoddy service is deliberate. All in all horrible experience. Food plus intimidation. Definitely would not recommend to tourists or groups of girls as you'll be treated with derision. Love this place! All the food is so authentic and fresh-tasting, and is priced in and around the £10 mark. I recently had the beef and peanut noodle bowl which is a classic fresh tasting dish, new on the menu - I would highly recommend. Of all the Vietnamese restaurants on this stretch, this is definitely one of my strong favourites. I haven't tried many dishes from here that I don't love! This is another very lively restaurant on the Pho Mile but apparently one of the best for vegans, thus the choice. It's got a massive menu which is amazing and they've got some great vegetarian dishes which you can ask for vegan, I'm not entirely convinced that I was getting vegan food - when I asked if they had any vegan food the waiter just pointed at the V for vegetarian on the menu, we did ask a couple of times if they were without animal products, it may well have been me being overly paranoid! The food however is utterly incredible - I dabbled in the vegetarian Vietnamese summer rolls, the salt and pepper fried tofu (which you absolutely have to get) and the the Vietnamese vegetable curry all of which I would recommend! The service can be a little curt but what that's all part of it! In an area with so many Vietnamese restaurants to choose from, I find myself fiercely loyal to Mien Tay. 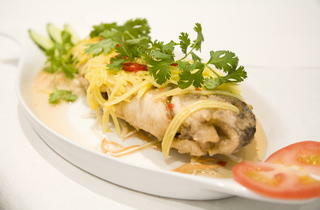 Don’t expect the world’s best service, but do expect deliciously authentic Vietnamese food at a really good price. I'd go as far as saying it's the best Vietnamese food I've had outside of Vietnam. Definitely worth a visit, to either here or their Clapham branch which is just as good. This Vietnamese restaurant, one of many in Kingsland road, is clearly not state of the art BUT it has the best Vietnamese food you can find around. Vermicelli noodles (any really), summer rolls and the best crispy duck you have ever tried are some highly recommended dishes. Haven't been to Vietnam to know how authentic the place is but it looks quite authentic, it has been recommended by Vietnamese people and it is very popular amongst them as well as many other ethnicities! Not to mention that it is super cheap (you can get really full with less than £15 per person) and they offer you free prawn chips by the time you seat! Last but not least, it is BYOB! Hygiene doesn't seem to be top priority though and the service is not the most pleasant but it is ok. Great Vietnamese food in low prices - I have been plenty of times and I'll go back again. Definitely it is worth a visit! No frills is exactly what I'd describe this place. They want you in and out faster than a Mcdonald's drive through, and really really don't want to have to go to the effort of pouring out some free tap water. The curries are pretty awesome though, and it's always nice to get a few complementary prawn crackers to tie you over until your pho arrives. If you're refuse to serve anything but grim alcohol though, please just scrap the license like the good old days. This is a really good shout for large table bookings. It's incredibly good value (therefore less bill splitting hassle) and they always seem to accommodate. It's no longer BYOB which is a shame but wine and prosecco were 15-20 quid a bottle, starters under a fiver and most mains around 7 quid... can't really argue with that. Service is slow and a bit haphazzard so can imagine being slightly frustrating for smaller tables, as we always seem to go here as a big group we're quite happy to get on with chatting while we wait. Spring rolls are crispy-deliciousness, the pho is massive, more than anyone could/should be able to eat in one go, the chilli charcoal chicken is a smash hit. Never had a bum dish from here to be honest. Definitely one of the best of the endless Vietnamese restaurants on Kingsland Road. The service isn't anything special but the food is seriously tasty and well priced. Been many times and have always been thoroughly satisfied with the entire experience, the SW London branch is also worth a visit if you're that side of the city! I had similar expreience like Daniel below. I ordered summer rolls. One with tofu and mushroom, the other one with shrimp and papaya. I had them without mushroom and without papaya. I mentioned it to the waitress and she said they ran out of mushrooms but the papaya should be in the roll and she just left me. I have not been offered anything else and the manager was rude as well and they charge me fully. £9 for this is a big failure. You should go somewhere else because customer service is rubbish, food is below the avarage. My wife and I (along with another couple) dined at Mien Tay the past Saturday evening and we had a fabulous meal. We rolled up to a packed restaurant with no booking and we were treated to prawn crackers while we were standing and waiting for our table. Once seated, I went with the amazing "Chargrilled Minced Beef in Wild Betel Leaves" (Bò lá lốt) followed by the satisfying "Spicy Rice Vermicelli Soup with Beef" (Bún huế bò). The others ordered aubergines, quail, some form of those well-known transparent rolls and a couple bowls of pho. We were all happy with the food and the service. I would definitely return. I generally cannot be bothered to review places I go to but after this experience, and also after seeing how good timeout is rating this I felt I had to contribute. I found a big bug on my main dish, a BIG BUG, not a flies, one big thing with legs, that does not fly. I should not comment further but I will also tell you that the manager was incredibly rude, insisting that we paid the whole meal after all of us seven people stopped eating aniything because we were absolutely disgusted. After insisting we had roughly 30£ discount, with is still unacceptable for this unpleasant experience. I recommend people to watch the hygiene rating on food standard agency, I did after going there for the first time and with no surprised I saw it is rated 2/5 which is poor. I love timeout and I am quite surprised they do consider that a good place, you can tell its dirty even without a dead bug On the prawn noodles. Go there, ask for Ken and listen to his recommendations! Both meals I had there were good, but the fiery papaya salad and whole fish were the best. We had great, friendly and helpful service on both visits. I had a delicious beef pho and a wonderful quail. Everything is very tasty and the staff is nice. £20 for two people, I'll be back ! I had a really delicious goat with galangal and green papaya salad. Their pho is good too. Complete with kitschy vietnamese decor, which all adds to the flavour - I've always had great service whenever I've been there, and the food is fresh and fast. Well priced. Great place! Excellent food at cheap price! Waiter is rude but I don't care! you don't come here for the decor or the service. But the food is fantastic, and very reasonably priced. Staff are polite, but the whole place runs on speed. Still, it has a great atmosphere, and the spicy squid is superb. Can't stop coming here. Avoid this place at all costs. The waiters are rude, they rush you and try and take away your dishes before you've even finished eating. They also short changed us and shouted when we tried to contest this. Overall it was the worst service I have ever experienced in my life at any restaurant. The food was cold, toilets are dirty, and the decor is terrible. All in all a bad bad bad experience. Great food. Goat curry and the Mien Tay spring rolls are a must eat. Service wasn't overly friendly however Mien Tay is all great, cheap food and not the surroundings. It's alright. Tried all of the Vietnamese restaurants around there, and have no doubt that Cay Tre and Viet Grill are the best quality. I occasionally try a different one (e.g. Mien Tay) but always end up regretting it. Song Que is the best of the rest - don't mind the rudeness, seems to be part of the course - but the manager can actually be quite charming. My fave of Kingsland road bunch. Salt and pepper squid is amazing. Yes, the tables are sticky and the service hit and miss, but at least they're not rude like they are at Song Que. I love it. Best Vietnames around, super cheap and excellent food! The service can be great or it can be awful, but it doesn't matter the food is too good for this to be an issue. Don't go here you you want artistic menus and a lovely wine list, or if you require the staff to wait on you hand and foot. DO go if you enjoy eating good grub, actually not good grub, if you enjoy eating some of the best grub around. All the bad reviews here seem to start with some complaint about the service, which obviously caused their tongue to reject anything that touches it. I wouldn't listen to them; I've been to most of the Vietnamese restaurants around and this is the best.